Hosting your wedding in an old warehouse sounds unglamorous, but an industrial-inspired wedding is both elegant and modern. Think high ceilings, exposed brick walls, and tall windows to frame your mod event. Give the brick and cement interior of your warehouse venue a splash of gold glam with metallic stationary and glass vases hand-dipped in sparkling gold paint. Put beautiful succulents front and center in your floral arrangements: these alluring plants are perfect in bouquets and make curious little favors for green-thumbed guests. Contrast brick walls and exposed steel beams with a flash of neon that spells out your love, and lean towards mod with an Art Deco-styled cake and over-the-top cocktails and appetizers. What was once an old warehouse, is now a glamorous space perfect for tying the knot. 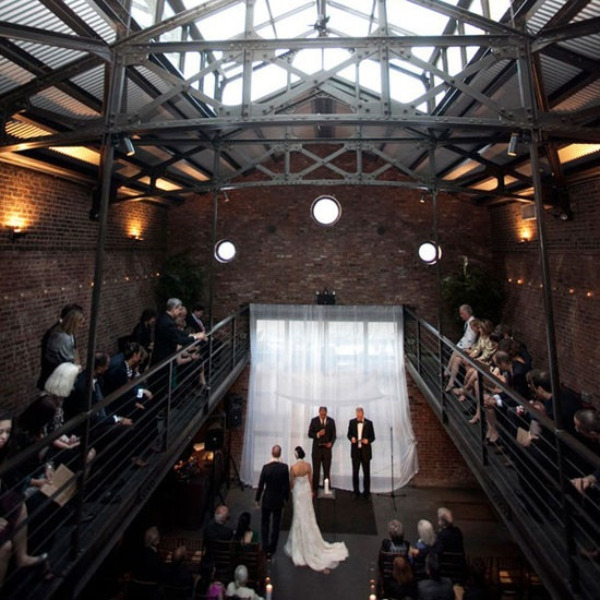 Get inspired to plan your own industrial glam wedding!